Our children and teenagers spend thousands of hours at school, and participating in school-related activities. It is a scary to know that our children are put in danger at the very place we expect them to be safest. Schools, school buses, and daycare centers are expected to exercise a high degree of care while in the charge of our children. Although schools are generally given some amount of immunity, those in charge can be liable for harm or injury to our children while under their supervision. Our attorneys and legal assistants are ready to help evaluate your legal options and receive the compensation that you and your family deserve. A custodian leaves a ladder in the hallway, and a student trips over it and falls, breaking his or her ankle. A loose railing causes a high school senior to fall down the stairs. She has permanent nerve damage from a [spinal cord injury], and she loses her scholarship to play softball at a prestigious college. A school undergoing construction has uneven pathways that are not clearly marked with caution tape or colored paint. A student [trips and falls], breaking several bones in his face, his hand, and causing a gash on his face. A child plays a sport in her physical education class and suffers a concussion because the teacher did not require her to wear the appropriate safety gear. School bus accidents are also very common. 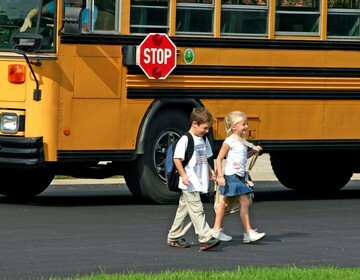 In fact, each year about 17,000 children are injured in school bus related accidents. These injuries happen most often when a school bus is involved in an accident with another vehicle or while children are boarding or getting off a bus. Most school buses are not equipped with safety belts, and as a result children are especially vulnerable to injury when they fall out of their seats during crashes or during sudden, sharp turns. In Nevada, when a child is injured or killed in a school bus accident, as the result of a bus driver's negligence, the child and his or her parents have a limited claim against the bus driver. Similar restrictions apply to the drivers of other vehicles and pedestrians who are injured due to the negligence of a school bus driver. Because the driver is a government employee, under the principle of sovereign immunity, he or she has immunity from lawsuits for his or her acts of simple negligence. They can, however, be held liable for acts of gross negligence: a degree of negligence that shows complete indifference and utter disregard of caution resulting in complete neglect of another’s safety. Gross Negligence can also be known as recklessness. In contrast, the school board itself is not warranted the same defense of sovereign immunity as are its drivers. A school board may be held liable for acts of simple negligence committed by a bus driver. Thus, it may be easier to file a claim against a school board rather than the school’s negligent bus driver. Clark County has a cap on damages through NRS 41.035 that limits awards up to $100,000.00. This is different than neighboring states like California which do not a have a cap on damages against County entities. Because evidence disappears quickly, and there are time limits to filing claims, it is important that you contact our office to learn about your legal options. Call us today at (702) 382-9797.